The average Monster Jam Cincinnati tickets at Cincinnati will cost you between $62 and $66, if you are looking for the cheapest seats then catch the event being held on 30/03/2019 for only $62. The average ticket will be at its highest of $66, on 31/03/2019. 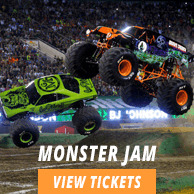 Minimum get in price is for Monster Jam Cincinnati tickets at Cincinnati is $11 for the event being held on 30/03/2019, there are certain dates that have a much higher get in price, for instance the cheapest seats on 30/03/2019, will set you back $22. Are ready to witness live incredible speed, power and mind-blowing stunts, all taking place on a two and-a-half million pounds of dirt! Monster Jam Tour is returning to the US Bank Arena with its high flying action, so make sure you buy Monster Jam Cincinnati tickets on time. Gigantic trucks, loads and loads of dirt and deafening noise. Monster Jam has become a family event due to its entertaining format and action-packed segments. Even if you're not a fan of cars and huge vehicles, you'll still end up having a great time at the motorsport extravaganza because of the non-stop fun. Get into the action early on by attending the Pit Party where you'll get to see the trucks up-close and take pictures with the drivers. In between the breaks when the trucks are getting ready for the main event, attendees are treated to live music and other segments. As soon as the trucks lineup for freestyle event the crowd goes crazy with excitement and cheer for their favorite monster. With the addition of Speedsters and ATVs, the stakes have gone higher in the competition and each driver will have to prove himself in a thrilling test of endurance. The aim is to lead with the maximum points and head to the Monster Jam Finals for an epic showdown. Get ready to have a blast on the Monster Jam Tour 2016.